I don’t know anyone who doesn’t like pizza. Do you? But it’s hard to please everyone as they all have their favorites. Well, with my family I have pretty much solved this problem. I make pizza at home, and everyone can choose their own topping. Depending on what I have on hand, I present them with 3-4 choices, and we go from there. Made from scratch pizza dough. ( Please see separate post for my dough recipe) Again, I rely on my bread machine to make a basic dough, which produces about 2 pounds. I do this periodically, and freeze it in 1 pound balls. Defrost at room temperature, stretch to fit your pan, and you’re ready to build your pizza. Frozen dough from the grocery store. Defrost and use as described above. Preformed pizza shell like BOBOLI. 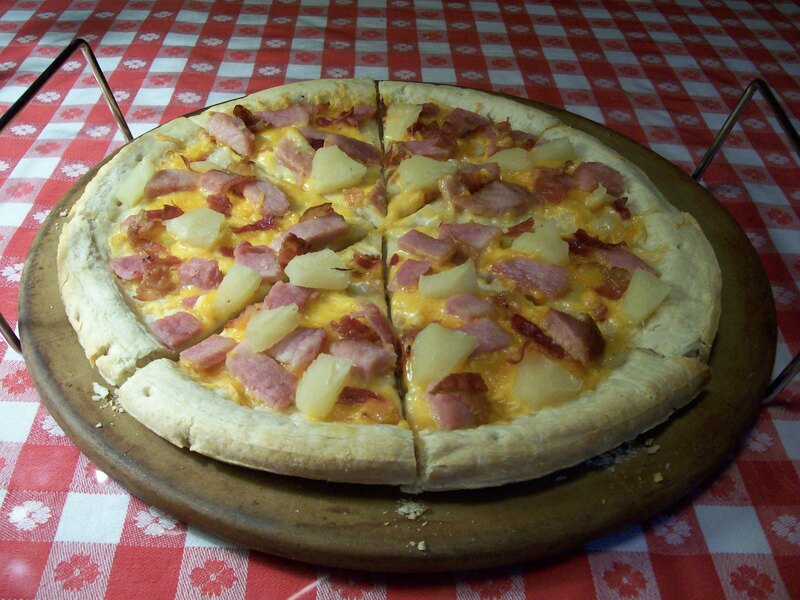 This gives you the option of making one 10″ pie, or choose a package with 4 smaller individual pies. Always prepare your pan in advance. This can be a pizza pan, a pizza stone, or large baking sheet. Mist or brush with olive oil, and sprinkle lightly with corn meal. This is optional, but it gives the crust a nice crunch. Roll or stretch the dough to fit the pan. Note: yeast doughs like to fight you; the more you stretch them the more they seem to shrink back. To win this fight, take it slow. Stretch a little, wait, let it rest. Stretch some more,wait, let it rest. Be patient, and you will win. Try to have as uniform a thickness as possible. There will be some air bubbles throughout. They are what give lightness to your crust. 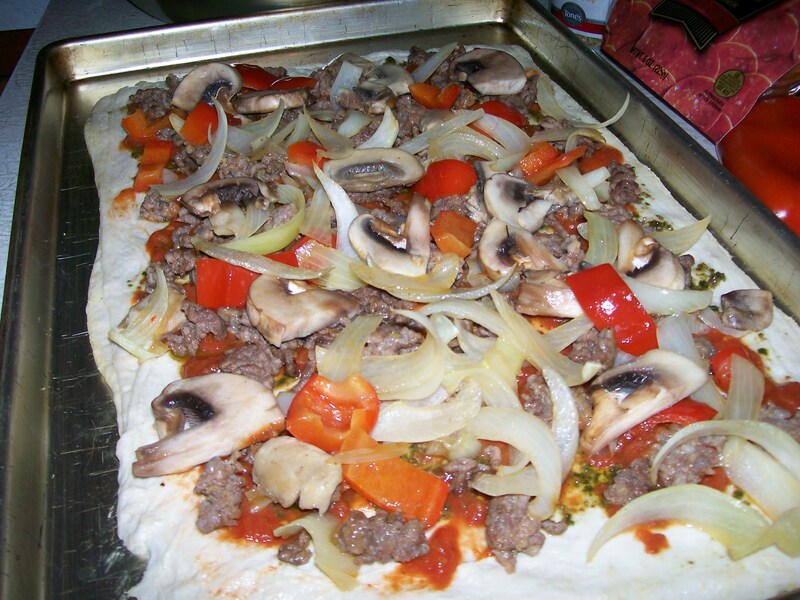 Before layering on the toppings, mist or brush the crust with olive oil, especially the outer margin, so it will brown nicely. Preheat oven to 400 degrees. 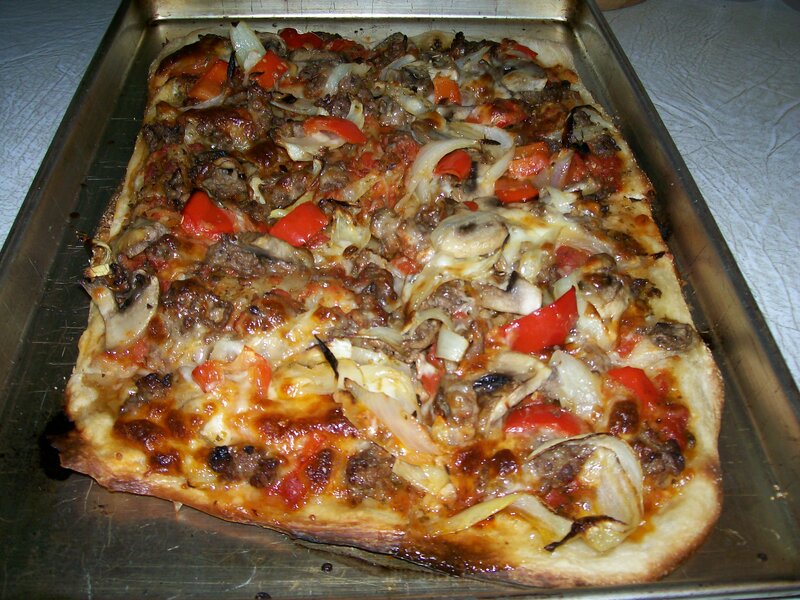 In a large skillet crumble the sausage and ground beef together, and cook until browned. Remove meats to a bowl, and drain pan, leaving a small amount of drippings. 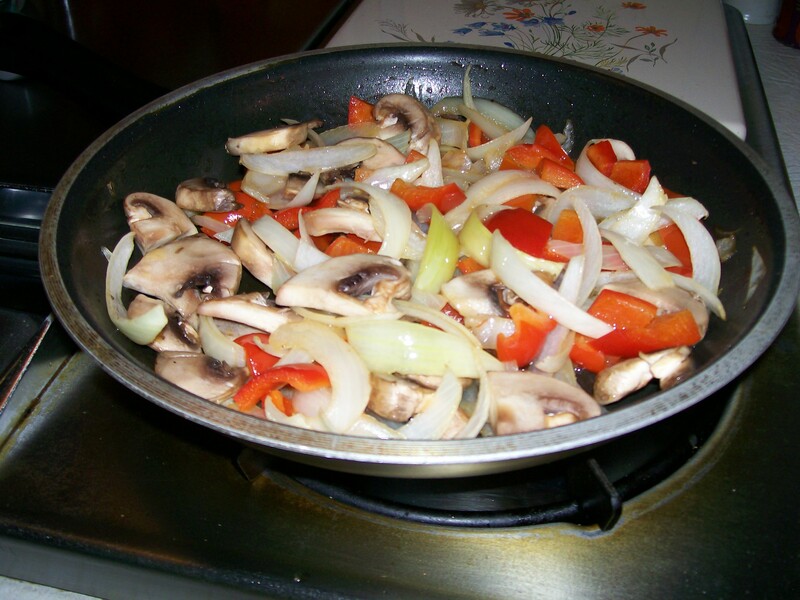 Place peppers and onions in skillet over medium heat and saute until beginning to soften. Add mushrooms. and cook 2-3 minutes more. Remove from heat. 3. Spred the basil pesto evenly over the dough. Top with the marinara sauce. 4. Add the cooked meats over the sauce. 5. Top evenly with the vegetables. 6. 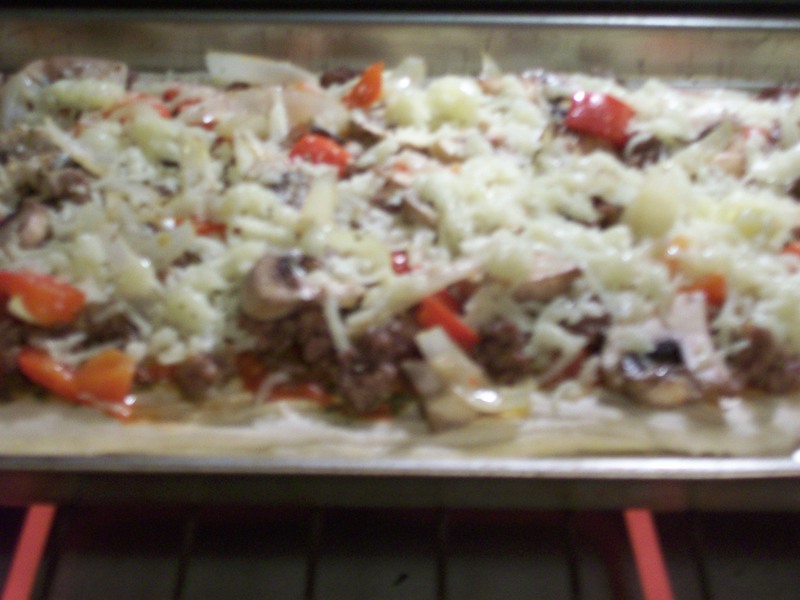 Before topping with the cheese, I like to sprinkle a little dried oregano, and red pepper flakes over the vegetables. 7. Bake at 400 degrees for approximately 20 minutes or until golden brown. Preheat oven to 400 degrees. Follow directions given above for pan preparation. 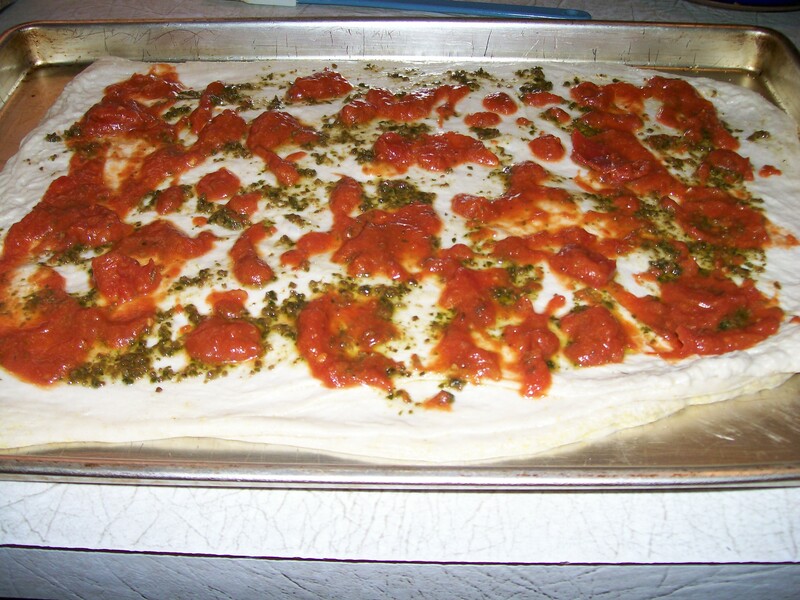 Mist dough crust with olive oil. Set aside. Heat a medium skillet on med-high, cook bacon, drain and crumble. Reserve 1 teaspoon bacon drippings, add 1 teaspoon olive oil, swirl to coat pan. Saute onions and peppers until tender crisp, add garlic and continue sauteing for 40-45 seconds or until garlic is aromatic. Remove from heat and set aside. Spread BBQ sauce over crust, leaving a small margin at edges. Layer ingredients in the following order: pepper-jack cheese, shredded chicken, onion-pepper mixture, Mexican cheese blend, top with crumbled bacon and red pepper flakes, if using. Bake at 400 degrees until golden brown, approximately 20 minutes. 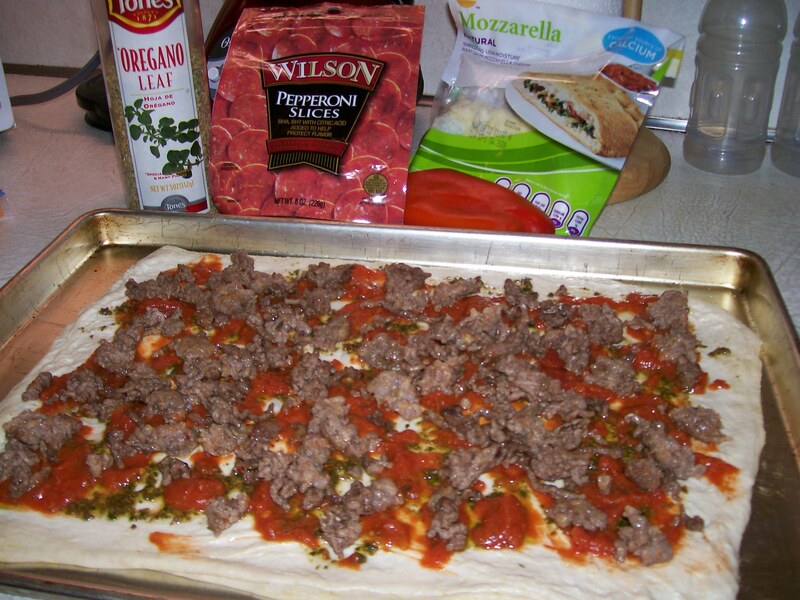 Prepare pizza crust and pan as directed above, misting with olive oil, especially the edges. 1. In small sauce pan, heat Alfred0 Sauce, thinning with 1/4 cup milk. Add 1/2 cup cheddar cheese, and mix until smooth. 2. Spread Alfredo Sauce mixture on pizza crust, leaving a small margin at the edges. 3. 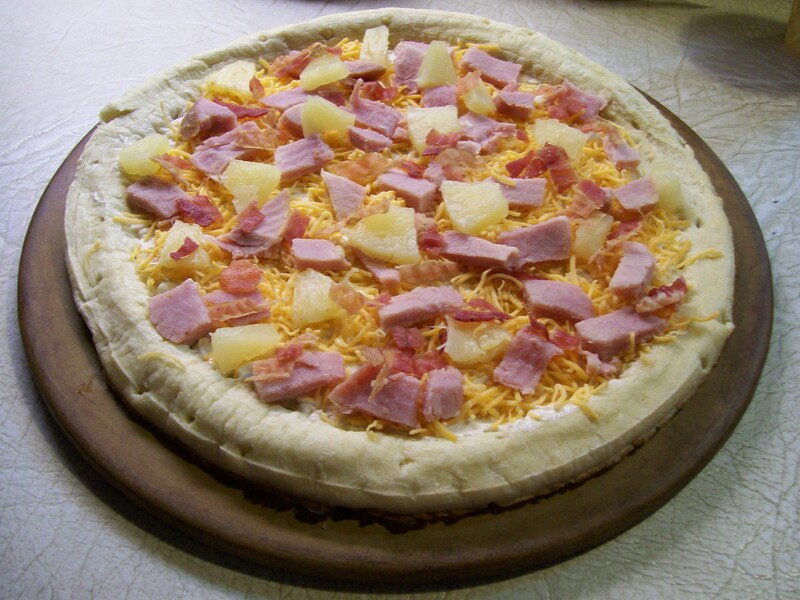 Top with ham pieces, pineapple chunks and bacon pieces. 4. Sprinkle on remaining 1/2 cup cheddar cheese. 5. Bake at 400 degrees for approximately 20 minutes or until browned.